When looking for a lift kit for your Jeep, two of the biggest considerations are flex and handling. You do not want to have to sacrifice one for the other on your 2 door Wrangler JL. The Skyjacker 3.5in Long Travel Lift Kit with Black MAX Shocks provides a perfect blend of suspension articulation and comfort. By using dual rate coil springs, Skyjacker allows the suspension to flex farther and ride smoother. 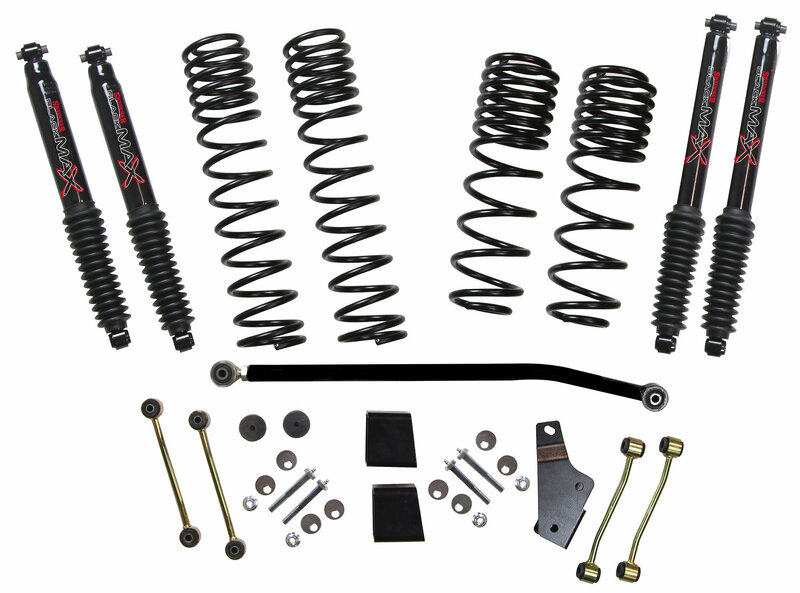 This kit comes complete with extended front and rear sway bar end links, bump stop extensions, a front adjustable track bar, rear track bar relocation bracket, eccentric control arm cam bolts, and Skyjacker’s signature Black MAX shocks. These shocks are engineered for on road performance and handling, while still being rugged enough for off-road use. The eccentric cam bolts correct axle caster without the use of extended control arms. Dual Rate Springs: Skyjacker improved their ride by using dual rate springs. 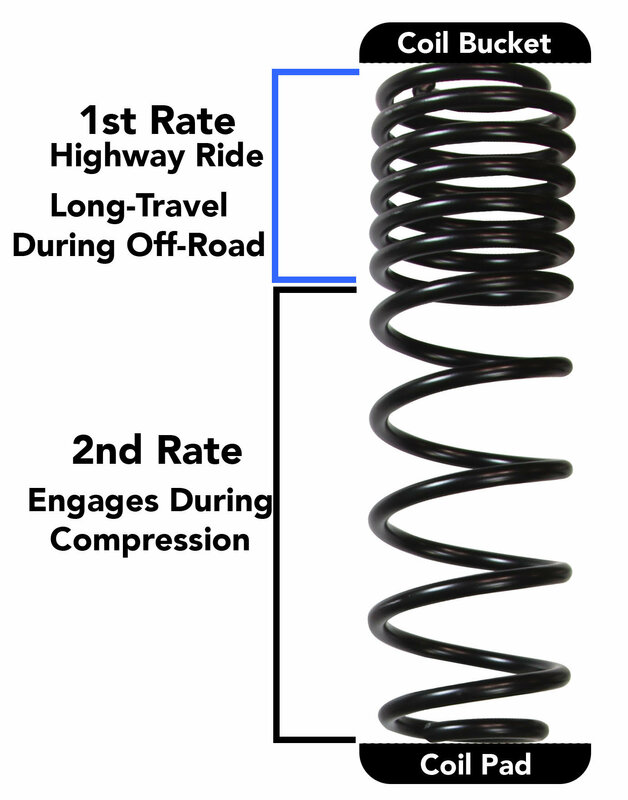 The First rate provides a comfortable highway ride as well as longer travel off-road, and the second rate engages during deep compression. Long Travel: Additional suspension articulation gives your Jeep the ability to climb over obstacles. By allowing axles to droop farther off-road, Skyjacker designed to kit to gain traction and overcome the toughest terrain. Vehicle Specific Design: Skyjacker designed this lift kit for the Wrangler JL. Not only has every component been engineered for your Jeep, but the springs are also tuned for the two door JL. Black MAX Shocks: Skyjacker’s twin tube Black MAX shocks provide a comfortable on road ride, while still being tough enough to hold up to off-road abuse. Skyjacker uses “foam-cell” technology to reduce heat and fade.